In 1609, the Great Twelve were required by the Crown to invest in the Ulster Plantation but were permitted to associate themselves with the minor companies. Under this arrangement, the Bowyers and Fletchers both invested £30 through the Clothworkers and but only one twelfth of this sum, £2 10s 0d, was actually paid by both. These initial investments carried with it the threat of further contributions and it would have been with some relief when, in 1611, the Court of Aldermen, assessed the "much decayed" Bowyers and Fletchers and exempted the two companies from any further payments (Note 1). Amongst a bundle of documents (Note 2) held at the Guildhall Library are two almost identically-worded parchments in the same hand, both dated 10th February 1617/18 (Note 2), one for the Bowyers and one for the Fletchers, which record the transfers of the benefit of the part-payments of £2 10s 0d and all future liabilities to the Ironmongers' Company, including the liability to pay the outstanding sum of £27 10s 0d. The transfer from the Bowyers is signed and sealed by five Bowyers - Wilfred Harrison, James Wood, John Jefferson, Joseph Arment and Thomas Brighwell. Four of these, the exception being Wilfred Harrision, are named in the Charter of 1621 - John Jefferson was one of the two named wardens and James Wood, Joseph Arment and Thomas Brightwell were among the first assistants. Joseph Arment was also named as master in the Visitation of 1634. 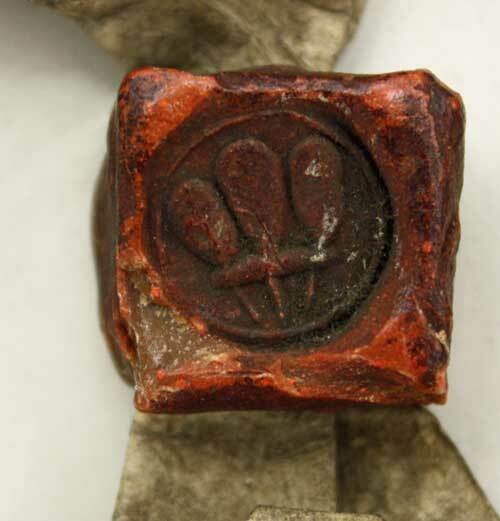 Only one of the seals remains attached, that of John Jefferson. By his will dated 1625, James Wood, left his estate at Isley Walton in Leicestershire to the Bowyers' Company. He is the company's most significant benefactor and his memory is drunk, by tradition in silence, at every livery dinner. It is interesting to note that he was the only one of the five to sign with his mark. The full transcription of the transfer from the Bowyers is set out below. 1. The Honourable The Irish Society and the Plantation of Ulster, 1608-2000: The City of London and the Colonisation of County Londonderry in the Province of Ulster in Ireland. A History and Critique by James Steven Curl (Phillimore & Co Ltd 2000) page 52. 2. Guildhall Library, London MS 17292 - The card index reads: Bowyers Company, Ironmongers' Company. 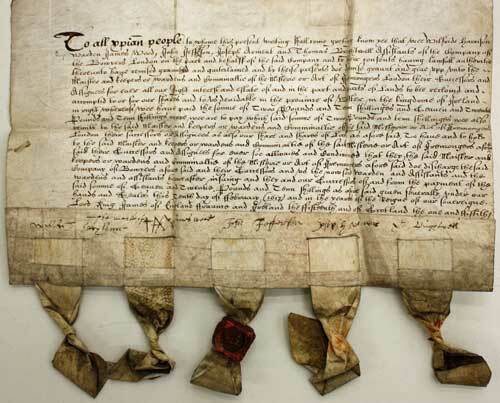 Irish Estate deeds including release of Fletchers' and Bowyers' Companies in Irish Estates to Ironmongers Co (1617/18), creation of Lizard Manor (1618 and 1663), and grants etc from the Irish Society1617/18 - 1729 vellum. 20 items in bundle in box, numbered 1 to 23 (7, 10 and 21 missing) with separate broken seal fragment in bag. To all Christian People to whom this present writing shall come greeting know ye that we Wilfred Harrison warden, James Wood, John Jefferson, Joseph Arment and Thomas Brightwell Assistants of the Company of the Bowyers London on the part and behalf of the said company and by their consents having lawful authority thereunto have remitted granted and quitclaimed and by these presents do demise grant and give up unto the Master and Keepers or Wardens and Commonalty of the Mistery or Art of Ironmongers London their successors and assignees for ever all our right interest and estate of and in the part and parts of Lands to be reckoned and accompted to us for our shares and to be dividable in the Province of Ulster in the Kingdom of Ireland in right whereof we have paid the sum of Two Pounds and Ten Shillings and Seven and Twenty Pounds and Ten Shillings more we are to pay which said sum of Two Pounds and Ten Shillings we also remit to the said Master and Keepers or Wardens and Commonalty of the said Mistery or Art of Ironmongers London their successors and assignees as also our share and shares of Land as aforesaid to have and to hold to the said Master and Keepers or Wardens and Commonalty of the said Mistery or Art of Ironmongers afore-said their successors and assignees for ever for always and conditioned that they the said Master and Keepers or Wardens and Commonalty of the Mistery or Art of Ironmongers aforesaid do discharge the said Company of Bowyers aforesaid and their successors and so the now said Warden and Assistants and the Wardens and Assistants hereafter insuing and they and our successors of and from the payment of the said sum of Seven and Twenty Pounds and Ten Shillings as aforesaid given severally under our hands and seals this tenth day of February (1617) and in the year of the reign of our sovereign Lord King James of England France and Ireland the fifteenth and of Scotland the one and fiftieth.